If you would like to order a Spectra sundial and know which direction it should face and where it is going to be located, simply fill in the direction and location boxes further down this page and click the buy button to enter our secure payment and ordering process. 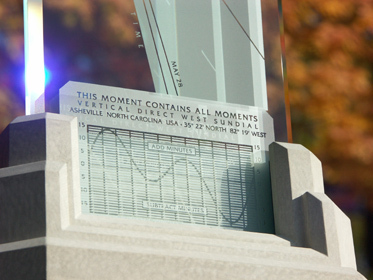 When we get your order, we will contact you personally via email to confirm your wishes before designing and making your custom Spectra sundial. If you don't like to do credit card transactions on the internet, you can download a Spectra sundial order form, fill it out, and send us a check (drawn on a US bank) in the mail. If you are giving the dial as a gift and you are unsure of the location details, or if you would like to give your recipient(s) the experience of having a custom sundial made just for them, you can buy a sundial gift certificate so your gift recipient(s) can contact us directly and have their new sundial designed and handcrafted according to their wishes at a later date. If you don't have much time and need the gift sooner than it can be personalized and custom made for your recipient, you can either order a Spectra sundial gift certificate and let them have the fun of participating in the design process to have it made however they would like it, or you can go ahead and order the dial yourself to get it underway now and have it made with your chosen inscription and details. If that is how you would like to proceed, write to us directly and tell us your wishes after you place the order and we will put your sundial gift in the production queue and send you a special certificate via email that you can print out immediately. The certificate shows a picture of the Spectra and says that it is underway in our studio and will be arriving soon...then you will have something to give them when you need it, and they will have something to look forward to that will arrive later when it is finished. The Spectra sundial currently retails for $295.00 (US) and is available for delivery worldwide. International currency conversion is conveniently handled during the ordering process by PayPal. You can use your regular credit card to order a Spectra sundial - you do not need to have a PayPal account. Standard US shipping ($20.00) will be added during checkout. Shipping charges on international orders will vary - if you order a Spectra for international delivery, we will simply email you a PayPal request for payment to cover any additional shipping charges. Indicate below whether your new sundial should face due W, SW, S, SE, or E. If you are not sure of the direction of your chosen window, that's OK...just choose "special direction" and we will figure it out for you during the design process - you can find out how we do that further down this page. Your Spectra sundial will be made for the shipping address you provide during the secure payment process unless you specify otherwise. At the end of the ordering process you will be given an opportunity to request any additional options you would like to include such as an inscription and date line. 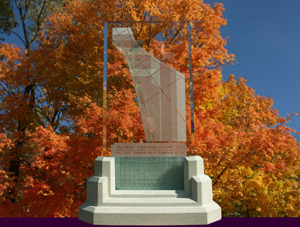 Be sure to give us a shipping address, and feel free to email us after you place your order to discuss personalizing your sundial. Whether or not you choose to add a special inscription or date line, you will receive a proof drawing of the proposed layout design directly via email for your review and approval prior to completion. We like to make personal contact with each of our clients...after all, we are making something very special for you. Why wouldn't we treat you special as well? If you need a non-standard direction Spectra let us know - we can use satellite imagery to have a look at your home and make the dial to match the direction of your chosen window. If your home does not show up in Google Earth and you need an accurate placement you will need to download our Sundial Positioning Form - by marking the position of a simple string line shadow on this form at any exact time and date, you will easily be able to supply us with all of the information we need to be able to make your Spectra sundial for whatever special direction you may desire. Mail or fax the form to us separately and we'll do the calculation at no extra charge, but bear in mind that the time necessary to perform this extra calculation will likely move the delivery date back on the finished dial. 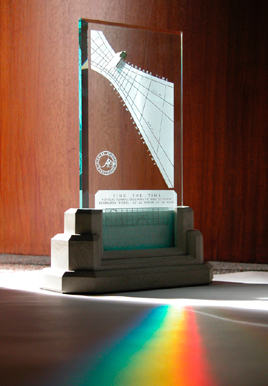 Upon confirmation of your order we will design and handcraft your new Spectra sundial specifically for your location and for the direction you would like it to face. We will normally ship your new one-of-a-kind, custom signature sundial within 2-4 weeks on average, but during busy periods in our studio it may take a little longer. Bear in mind that the time it takes to individually handcraft our custom sundials may vary during occasional high activity periods or when lots of Spectra orders or gift certificate redemptions arrive all at once. If you want to order a gift and the special day is fast approaching let us know - we try to reserve time in our production schedule to accomodate rush orders and will do everything possible to make sure you will have your gift in time for the special occasion. When your new custom sundial is finished we will notify you when it ships, and US customers will typically receive their new Spectra sundial about 2-3 business days after that. Overseas international shipping may take a week to 10 days, depending on how fast the package clears customs upon entry to your country. Any import taxes or customs duty levied by foreign destination countries are the responsibility of the customer and may need to be paid at the time of delivery. We have no way of predicting the current taxation policies and rates for foreign countries, though many countries that have trade agreements with the US do not tax imports from the United States. Artisan Industrials uses PayPal for all of our secure online transactions. You do not need to have a PayPal account to buy a Spectra sundial.